All Hands on Deck for Feb 26 NYAPRS Legislative Day! NYAPRS Note: While there several positive items in this year's Executive Budget, two critically important issues were left out: the 2.9% Cost of Living Adjustment (COLA) and only $10 million in rate increases for mental health housing programs. 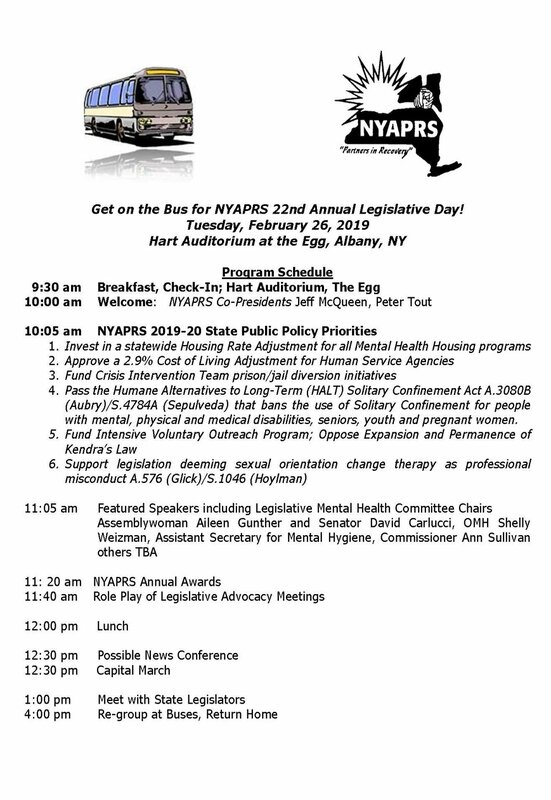 NYAPRS is finalizing plans to bring as many as 600 self and system advocates to Albany for our February 26th Annual Legislative Day, coming in from every corner of the state on upwards of 18 buses from New York City, Long Island, Westchester-Putnam counties, Newburgh, New City, Binghamton, Buffalo, Syracuse, Westport and Rochester. Save that day and get on the bus to fight for community services, criminal justice reforms and rights protections! We will have bus captain contact information early next week. See you on the 26th of February!